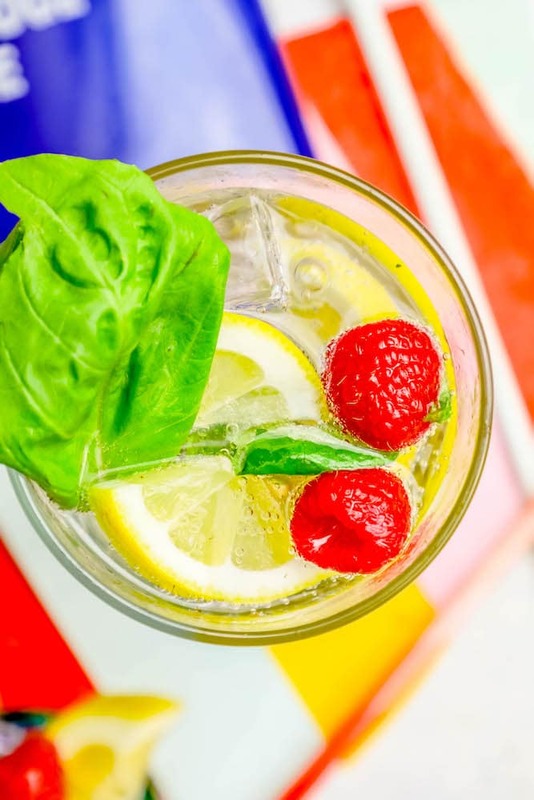 Delicious Sparkling Raspberry Lemon Basil Gin Cocktail Recipe is fresh and delicious – full of raspberry, lemon, and basil flavor that is perfect for a bridal shower or brunch! Can be made in bulk as a fun gin party punch, too! 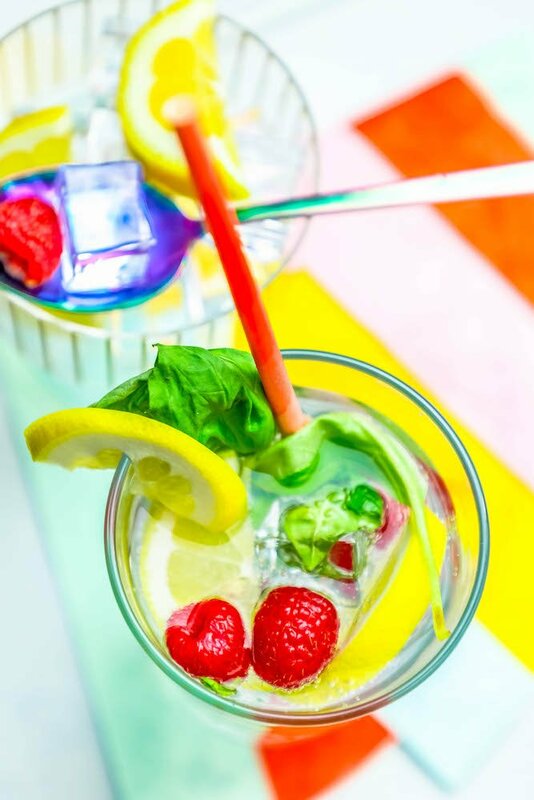 My new favorite easy and delicious gin cocktail is this Sparkling Raspberry Lemon Basil Gin Cocktail Recipe – a fresh, sparkling spritzer that tastes great and is perfect for a party – especially a bridal shower or garden party! I love gin – simply over ice, with tonic, and in cocktails – the light and herbal flavors go so well with fresh fruit, herbs, and citrus in spring and summer. Gin is one of my all-time favorite spirits, and I love trying out new brands to see how different they all taste. It’s crisp, light, not overpowering, and fabulous in refreshing cocktails that are easy to sip all day long. 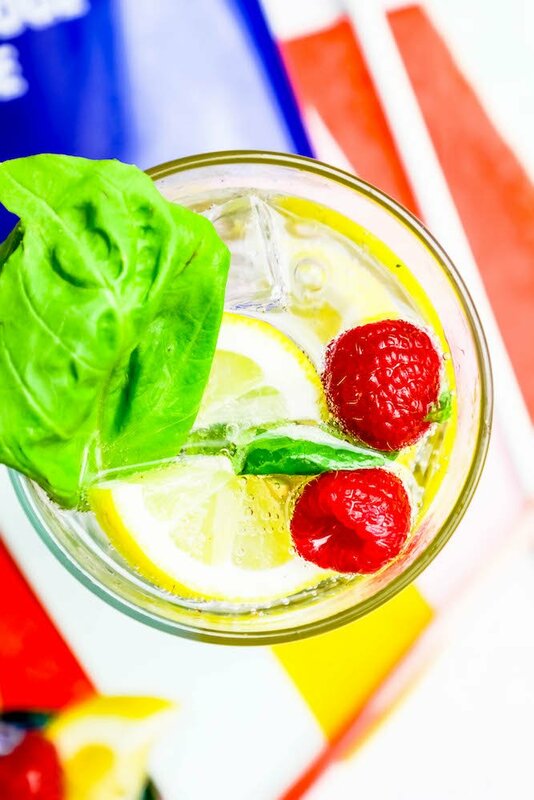 This easy gin cocktail is bursting with fresh basil, raspberry, and lemon flavor – with tons of bubbles – and it’s really pretty for a party! When considering a gin to pick for a cocktail, it’s important to understand some of the flavor profiles that make up gin! Since gin can vary SO much from brand to brand (Gin, as a rule, is a mix of a clear spirit with different botanicals that all include juniper (or sometimes pine)), it’s important to know what different flavors can make up a brand’s proprietary herb blends. There are different flavors you will find that make up gin that can greatly influence how they work in a cocktail – which is why a gin cocktail can vary so much more than one made with vodka. It’s important to know what the main flavor in your gin is so you know how it will work in your drink, and find one you like! Gin is one spirit where brand choice makes a HUGE difference. Some gins are light and have notes of citrus – some taste more like pine and juniper, some taste strongly of mint and anise. Since I loathe anything licorice, and really don’t like anise much, I avoid gins with more of the licorice-like herb. Some specialty gins (like my current favorite – boutique Irish brand Bertha’s Revenge, which is made from spent milk whey from Irish daily cows- ) tastes strongly of cardamom – which I love, but doesn’t work well in a recipe with more subtle flavors like this cocktail. For this drink, I prefer a lighter gin with a bit more citrus and juniper notes – less spicy or herb-forward, such as Hendrick’s, or my absolute favorite Botanist from Islay. You can find either at most liquor stores in the US. If you’re going for a big batch of gin spiked party punch for a bachelorette party or wedding shower, I’d opt for Bombay or Tanqueray to keep the budget down a bit. Muddling fresh herbs can release the oils in the leave – bringing you tons of flavor! If you dont have a cocktail muddler, you can press the back of your spoon against a glass to release the oils and bring your drink tons of basil flavor. If you don’t want to muddle a ton of basil for a giant party batch of this cocktail, i recommend snipping the basil with kitchen scissors into thinner ribbons so the oil releases – tossing basil in the glass without releasing some of the oils won’t bring out the basil flavor that makes this cocktail so fresh and delicious! I like to shake my drinks to make them extra cold, but it’s totally optional. This is great with a quick stir, too! Is Fresh Lemon Juice Better Than Bottled in a Cocktail? While I almost always prefer fresh lemon juice, there are a lot of cocktails whose flavor profiles benefit from the concentrated lemon juice you can buy in a bottle in the store. While bottled lemon juice is still the same thing – it has been filtered so there is no pulp, and is usually concentrated, meaning excess water was removed. This give bottled lemon juice a sweeter, tarter taste that is great to cut through rich, powerful flavors – while fresh squeezed lemon juice tends to be a bit softer, and less tart. Since this drink relies on lighter flavors to compliment Gin’s naturally complex herbal profile, I opt for fresh squeezed lemon juice. This is a personal preference – but it’s good to know which works better in different dishes. 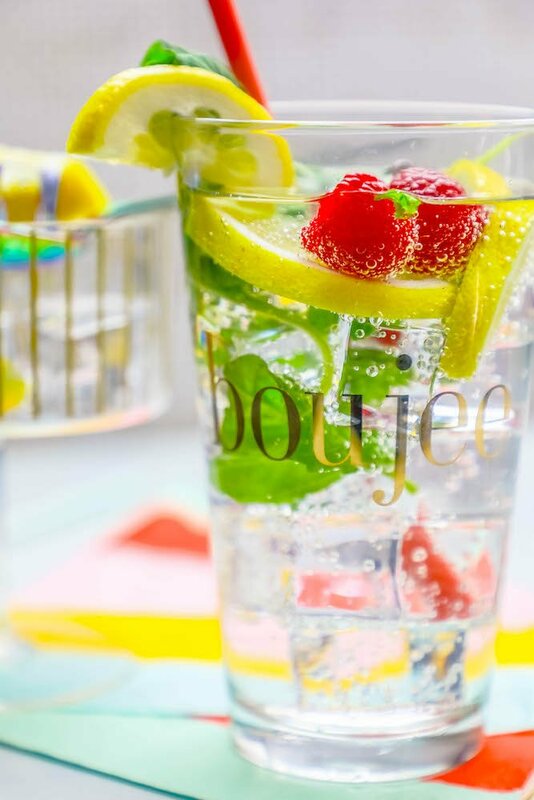 Gin Drinks are often served in highball glasses – anything over ice should go in a tall glass, as well as any cocktail with lots of non-alcoholic mixers. 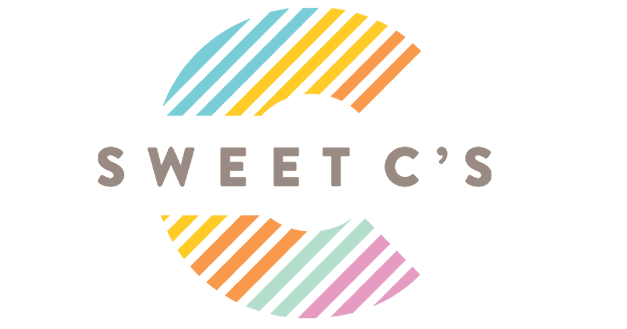 I went for a pint glass I grabbed from Urban Outfitters that I am obsessed with, along with some fun party goods from the Sugar and Cloth line in their new Amazon Home line! 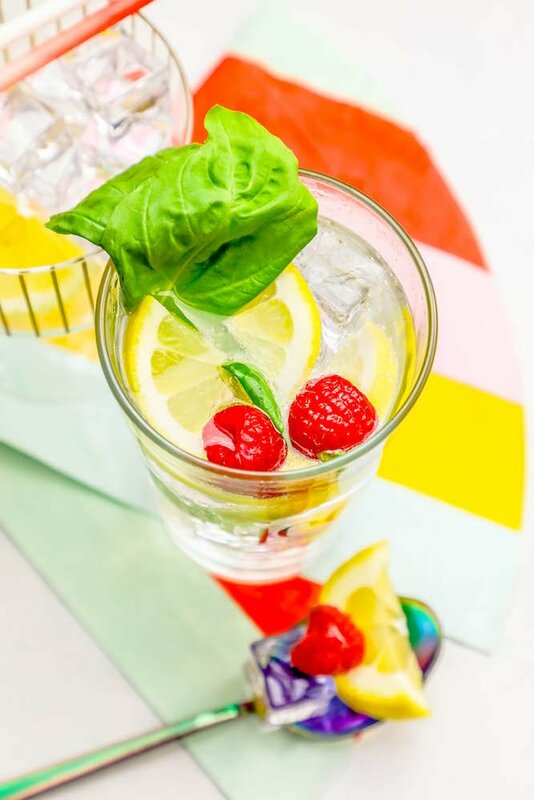 If you love this Sparkling Raspberry Lemon Basil Gin Cocktail Recipe as much as I do, please write a five star review in the comment section below (or on Pinterest with the “tried it” button – you can now add pictures into reviews, too! ), and be sure to help me share on facebook! 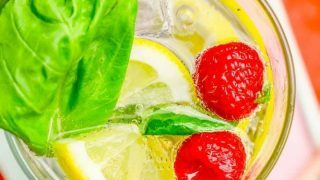 Delicious Sparkling Raspberry Lemon Basil Gin Cocktail Recipe is fresh and delicious - full of raspberry, lemon, and basil flavor that is perfect for a bridal shower or brunch! Can be made in bulk as a fun gin party punch, too! In a cocktail shaker full of ice, add gin, raspberry extract, and lemon juice. Shake well and pour into glass with ice and raspberries and lemon slices. Top with tonic and lightly stir to mix.